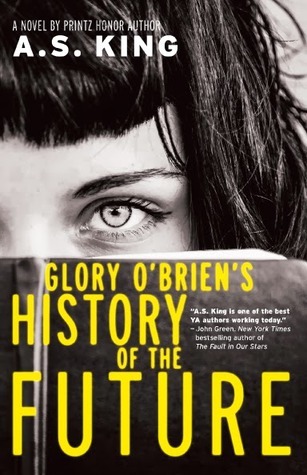 Having fallen madly in love with A.S. King’s writing during Everybody Sees the Ants, I have been waiting for my students to return Glory O’Brien’s History of the Future to my library so I could read it. Without ever having booktalked it, its catchy cover caught students’ eyes and enticed them to dive right in. Finally, yesterday, I spotted it on the shelf and took it outside in the sun with my class to begin reading. Surrounded by seniors mere weeks before their graduation, I was in the perfect setting to immerse myself in Glory’s story, which takes place over two weeks bracketing her high school graduation. She’s a photographer for the yearbook, keeping herself distant from her peers by hiding behind a camera. Her only “friend” is her neighbor Ellie, who’s lived beside her ever since Glory’s mother committed suicide thirteen years ago. Ellie doesn’t understand the worry Glory has that she’ll end up like her mother–and Glory is terrified of, dreading, trapped by, her own uncertain future. That all changes after a wild night, after which Glory and Ellie can suddenly see the future. Glory begins to record these transmissions, in which, upon eye contact with anyone, she can see the actions of their distant ancestors and descendants. The glimpses of the future reveal a future American Civil War, the complete reversal of feminism, and a tangled web of people she knows mixed up in all of this. Deciding to chronicle her transmissions through a scrapbook modeled after one of her mother’s creation, Glory writes her own “History of the Future,” and it’s bleak. As the novel progresses, the darkness of the future becomes more certain, but so does Glory’s understanding of herself–a trade-off she’s not sure how to handle. With beautiful language, dark humor, powerful lessons, and themes of mystery, love, redemption, friendship, and foreboding–all set against the backdrop of high school graduation–I can see now why this book is never on my shelves. I’ll be happy as it continues to remain in the hands of teens getting a refresher on feminism, individuality, and the pursuit of happiness.